ATLANTA (AP) — The Atlanta Falcons‘ defense has one primary goal entering Sunday’s game against Dallas: Slow down Ezekiel Elliott and make Cowboys quarterback Dak Prescott try to beat them with his arm. Atlanta’s struggling defense should get a boost from the return of middle linebacker Deion Jones, who hasn’t played since breaking his right foot in the season opener. When healthy, Jones is the Falcons’ best defender. He calls the plays, is stout against the run and is fast enough to cover running backs and receivers in coverage. 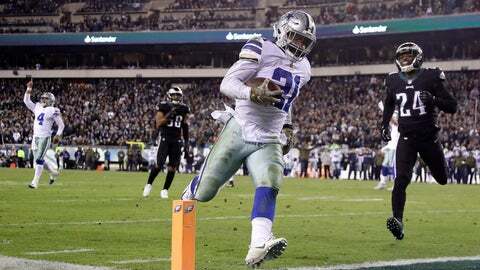 Elliott is coming off a dazzling performance — 19 runs and six catches for 187 yards from scrimmage and two touchdowns — in a win at Philadelphia. But the Cowboys had to stay the course early when Elliott had just seven yards through the team’s first two possessions. Dallas’ defense faces a tough challenge in matching up against Atlanta quarterback Matt Ryan and star wideout Julio Jones, who has reached 10,000 yards receiving quicker than any player in NFL history. Ryan needs the threat of play-action, but that’s hard to maintain when the Falcons’ running game starts strong and fades. It’s been a frustrating trend all season.